Oh dear. What have I done? Where has all the knitting gone? Pardon me while I brag a bit. I don't do it often - or at least I try not to...but I'm quite pleased with myself right now. 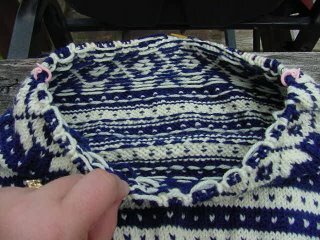 Rosemary recently decided to take on a stranded/Fair Isle (which is it??) 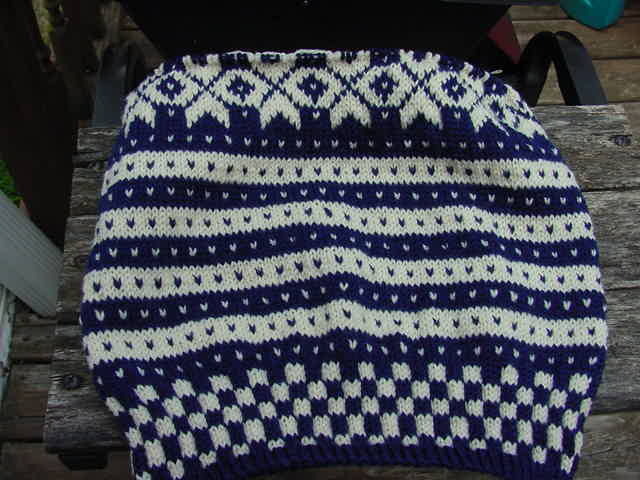 Dale of Norway sweater and well...blame the Borg...resistance was futile and I endeavored to do the same. 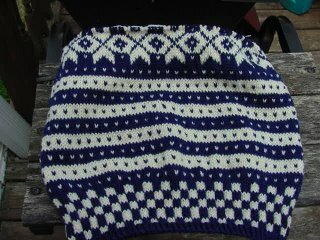 Thanks to Caryn's suggestions about good beginner stranding/Fair Isle projects (she suggested that it may be helpful to start with something that only uses 2 colors), I decided to tackle "Fana" from Dale of Norway. 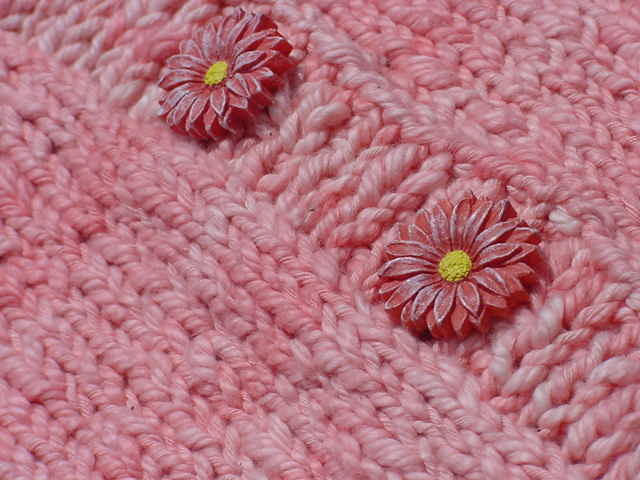 I am doing the pullover version, in the pattern's smallest child size. I really had no idea what to expect or how many tries it might take to get the hang of using two colors simultaneously, but honestly, the biggest hurdle was simply figuring out how best to hold the yarn. 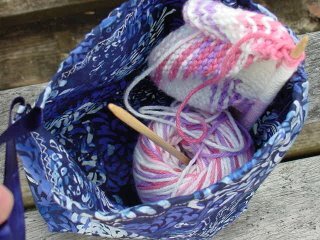 I tried all the options, but being a continental knitter, I just couldn't have a yarn in my right hand. It wasn't right! So I put both in my left hand and off I went! I started early Saturday afternoon and as of 8:30 this morning, I am almost through the chest motif. 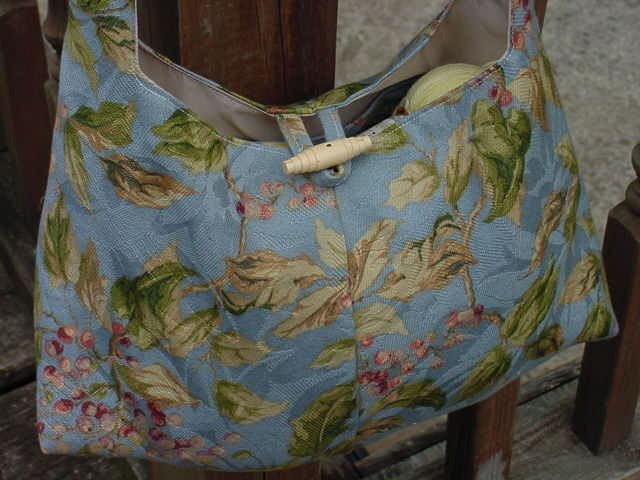 I think the inside looks quite nice, too, don't you? 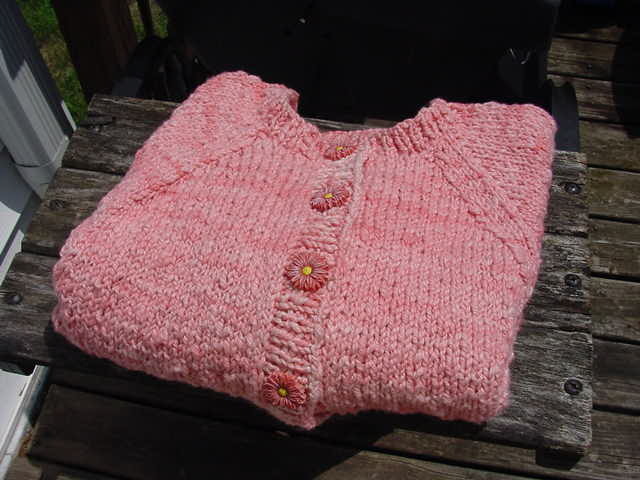 The pattern is an Ann Norling pattern for a simple, bottom-up kid's raglan sweater, with several options for gauge and style. The yarn is Araucania Nature Cotton that I rescued from Cookie A's stash! The buttons are La Mode, from JoAnn's, and I love them. 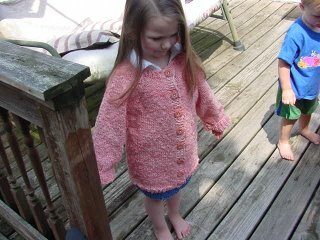 The sweater did turn out a bit bigger than I anticipated, but I'm glad. I had hoped that Natalie would be able to wear it next year, too, and clearly, that will be possible. 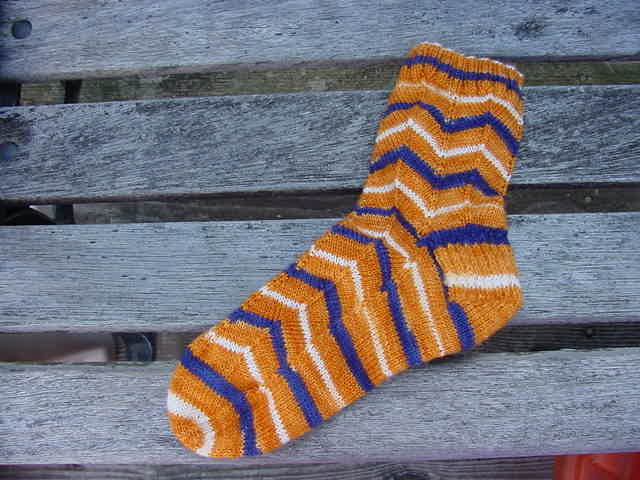 I haven't done any sock knitting lately, but I did decide to try out Cara's idea of the log cabin using a random number generator instead of an actual pattern. Natalie has been asking for a blanket and while these colors would not be MY first choice, they are right up her alley. 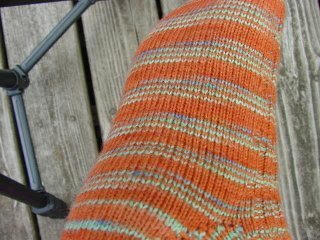 Since this will be an everyday, drag around the house sort of blanket, I went with Caron Simply Soft. Acrylic, yes, but should last forever. 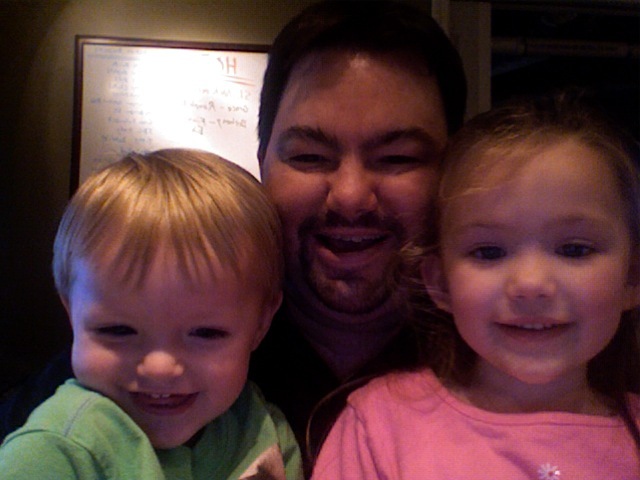 Greg got a new computer (MacBook Pro) this weekend, so he and the kids decided to try out the iSight camera. Aren't they cute?? 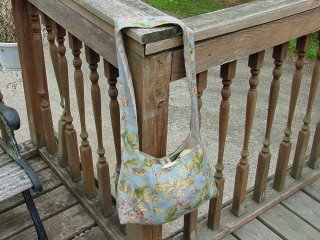 I finally decided what to do for my KSKS pal's bag...the Tiny Happy Shoulder Bag. I love it! 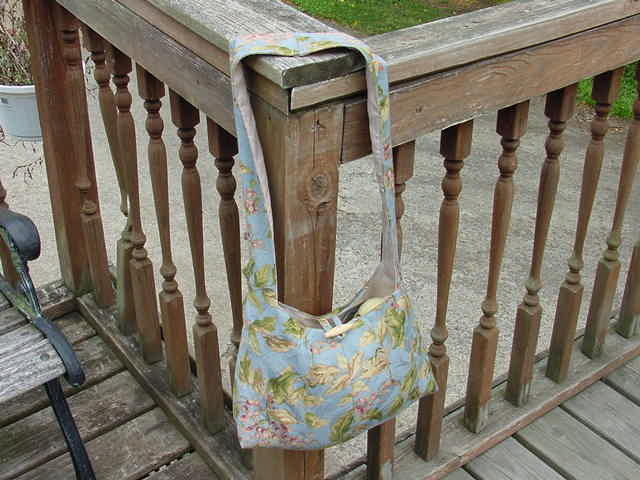 The pattern is easy to follow and easy to make and in fact, I've already made another bag! 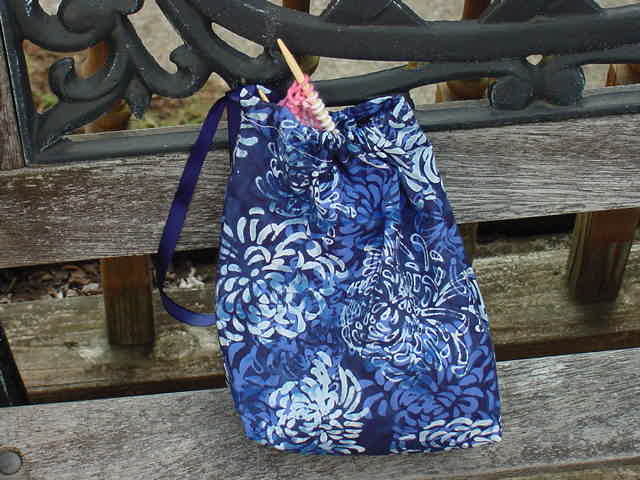 Now I have almost everything for my pal...I have the bag (along with a little project bag, too), yarn, a pattern, more yarn (not sock yarn, but it's from my stash) and a little spiral-bound index card book in a plastic case (great for writing patterns in and putting in your knitting bag or purse). 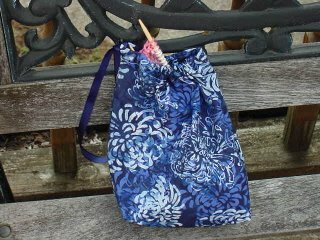 I have some knitting needles coming and still need to get some snack goodies. 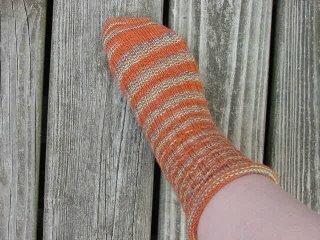 I'd like you to meet Ginny, my new sock. I liked Rosemary's broken rib pattern so much that I decided to take the idea and run with it. Mine was modified to a long/short broken rib and I added a rolled cuff. 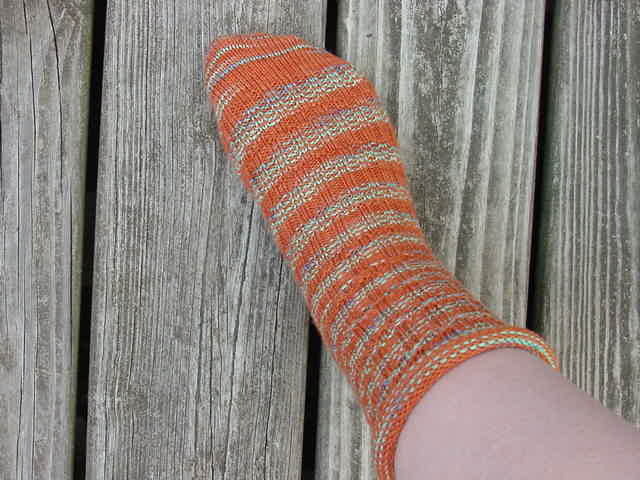 Worked toe-up on sz 1 Addi Turbos (which are really a US 1.5). The broken rib is 12 rows of k2p2, then 4 rows of p2k2, repeated. 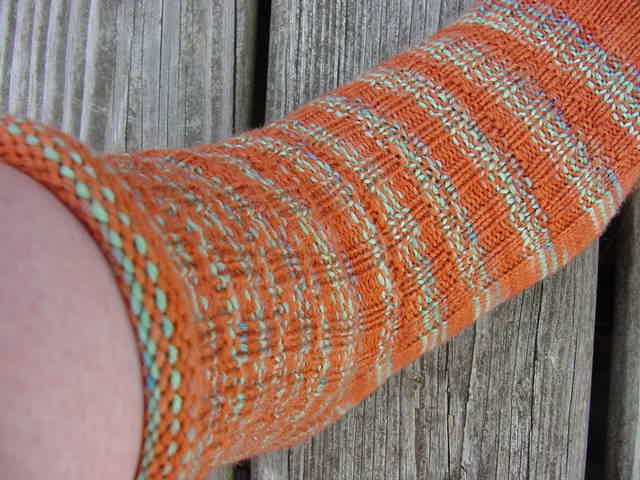 The yarn is from the Monsoon Winds Etsy Shop. 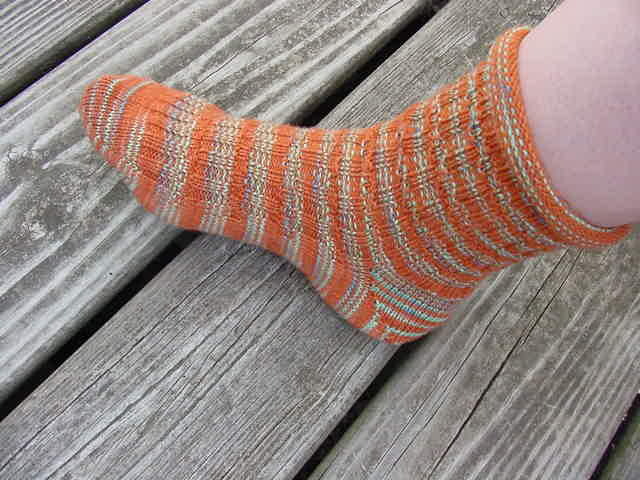 I have to say this is the best-fitting sock that I've made yet. In other finished-object news...I give you a finished Illini Jaywalker! 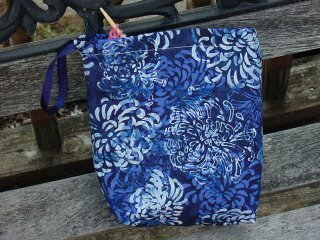 I also decided to delve into my fabric stash yesterday and try out a little project bag. I received one from a fellow knitter recently and love it...simple enough to figure out the pattern, so here is mine. 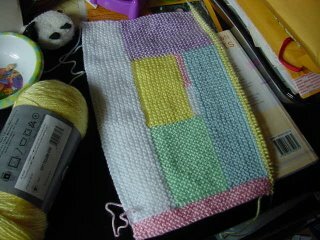 It's about 8.5" square - this one has a ball of kitchen cotton, the start of a dishcloth and two needles inside...just for reference.